Magma Monsters adds in a little extra to the Overworld or the nether. 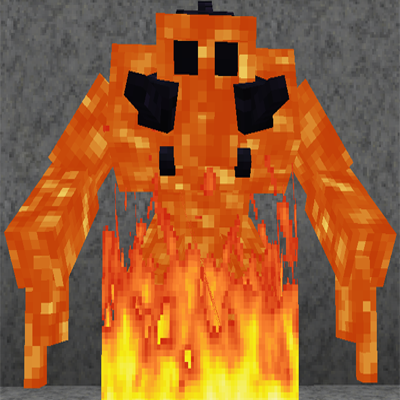 The Magma Monster is nothing to mess with as it Spawns Around Lava and has ranged attacks and sets things on fire as it walks. In the config you are able to change the following. Control if the Magma monster spawns in the Overworld or Nether. Control the Spawn Chance Probability in both the Overworld and the Nether. Control the Min and Max Group size in both the Overworld and the Nether. Control if the Magma Monster can set things on fire as it walks. you are free to include it in your modpack. All we ask is that you do not claim the mod as yours and add a link back to here if you are able to. A BIG THANKS goes out to Shinoow for the Monster Sounds. Would it be possible to make an option to set a *minimum* Y spawn height in the nether and in the overworld? I'm toying around with the concept of mountainous volcanos and would love to incorporate the magma monsters into them, but not so much elsewhere in the world. Looking forward to using this mod - I'm a fan of all mods that add more variety to the creatures that spawn. I know I'm a little late to the party, but if you want fine-tuned control over mob spawns, I recommend the In Control mod. Ok looked at your post on the China Forum and if you can get me the China Lang file I can include it into the next update of the mod. As for permission, as of right now I am ok with the way it is posted of the site. Just a little advice... Make sure to get permission next time instead of just making a post. How does the Spawn Chance Probability calculates it self? As default they spawn almost in every lava area. I'm looking to make them a bit rare, they are to awesome to be a common enemy. although I could be wrong, it is the middle of the night and I dont have the code open at the moment to look. I haven't fought too many, but it seems they don't have drops? Are you ever gonna add in the ability to set it to have custom drops? Let me know if you do! Magma monsters drop blaze powder or magma cream if in lava form. if in obsidian form they drop obsidian. Grunts drop magma cream if in lava form. if in cobble form they drop cobblestone. 1. Please change the mod name from "magma_monsters" to "Magma Monsters", as this looks better when using Waila/Hwyla. 2. Can you make the mobs emit light just like lava? 2. That's a good idea - I'll look in to adding it as a configurable feature. There needs to be more mods like this. It's a unique mob in the style of vanilla. Hi; would be interested in trying this in my 1.11 modpack. Hoping this will be possible soon! I cant figure out what I am doing wrong, but I have this mod installed for two weeks and havent seen a single magma monster... even in the nether. My configs didnt mess anything up right? That looks OK - if you are having trouble finding the mobs spawning in, you could increase the number for the spawn chance to something bigger. The mob will only spawn around near where there is lava so it is fairly localised.